One of the women who survived Sunday's deadly Metro-North derailment said she didn't think that one of the four passengers who died in the crash "felt any pain." 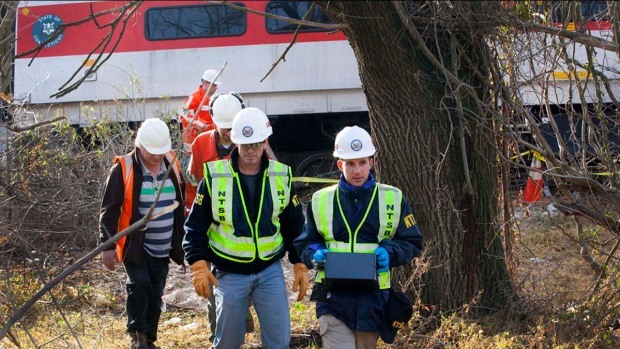 The passenger, who asked to be identified only as "Anna," told NBC 4 New York that she and other passengers tried to help Kisook Ahn, a nurse who was killed after the train went off the rails around a sharp curve in the Spuyten Duyvil section of the Bronx. Anna said she and other passengers grabbed a stethoscope from Ahn's own work bag and tried unsuccessfully to find a heartbeat while the Queens woman was pinned inside the train car. "I don't think she felt any pain," she said. "She was finishing dying while we were with her." She added, "We were there for her. We tried to help her but we couldn't and I'm sorry I couldn't, but I did pray for her." Anna described a chaotic scene in the seconds leading up to Ahn's death. What started as a normal commute to work began routinely with a crossword, but she said she could feel the car start to tilt as the train attempted to round the sharp curve, which federal investigators later said was at a speed of 82 mph. The next thing she knew, she was tumbling around in the car. She hit her head on the luggage rack, she said, and the train's metal siding peeled back like a tin can and debris flew into the car. She curled into a ball and thought of her family. "I can't die here," she recalled thinking. "I'm not going to die here. This isn't happening." When the train came to a stop, she and other passengers found Ahn and another woman both pinned. She said she gave the other injured woman her cell phone so she could call her family. Eventually, the adrenaline rush of the crash was replaced by excruciating back pain, Anna said. Four days after the crash, she said she's still in an incredible amount of pain and has already filed preliminary paperwork for a civil claim. "My daughter, she wants me to hold her and hug her and play with her and I can't really move," she said.